Check out the latest budhibox Coupon on My Subscription Addiction! BuddhiBox Black Friday Deal – 50% Off Your First Yoga Box! BuddhiBox Coupon – Free Gifts With Pre-Paid Subscriptions! BuddhiBox Coupon – 20% Off Your First Box + Shop Purchases! BuddhiBox Coupon – 25% Off Your First Box or 15% Off Pre-Paid Subscriptions! BuddhiBox Cyber Monday Deal – 50% Off Your First Box! 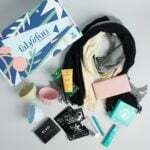 BuddhiBox Black Friday Deal – 20% Off Gift Bundles & Gift Subscriptions! BuddhiBox Subscriptions on Sale at RueLaLa! "Hi Miss Pippa! You’ll love Buxom's lip polish, if you like lip plumpers! It has just a tiny bit of a tingle, for..."